It is intriguing that after many years of dispensing advice on Dominiques that I have such difficulty writing about this topic. The problem isn’t a loss for words, but rather a limitation of space. The American Dominique – A Treatise for the Fancier contains 30 pages on breeding Dominiques and countless other tips and pointers scattered throughout the book and here I hope to reduce that to just a couple of pages. Regardless of where the stock originates you need to familiarize yourself with the Dominique’s standard. Specifically, I’d encourage the novice to focus on type or body conformation and the Dominique’s carriage. Color and feather pattern are important, but only after you have type. For 70 years the Standard of Perfection contained the black-and-white Dominique artwork by A. O. Schilling. When the Standard was revised using colored pictures the Schilling artwork was dropped. It is my opinion that no one before or since Schilling has come close to portraying the Dominique correctly. If you are unable to obtain an old copy of the Standard, the A.P.A. still sell a “black and white” version of the Standard that incorporates the old artwork. A close study of the Schilling artwork will give you a better appreciation of the correct body type and carriage. Whether you raise the Dominiques from a box of chicks or pick them out at a breeder’s farm, eventually you’ll be faced with having to select the Dominiques that will be your breeders. What follows is an attempt to guide you through this sometimes-confusing process. The best way to begin the selection process is to look for the ideal male. Don’t look at the females while picking the male, as it is too easy to get distracted. Below are the main points that should be considered, in order of importance. A very similar list would be used for the hens. Again, while working with the hens don’t allow yourself to become distracted with the male you selected. The number one consideration is the slope of the back. The Dominique back slopes DOWN from its neck and shoulders in both the male and female. It is impossible to get a good Dominique with either a flat back or an upward slope (like the Plymouth Rock). In fact, this year I am searching my flock for a very “upright” male as the birds are becoming too close to horizontal. The next most important feature is the tail. The tail should be medium length and full. When viewed from the rear it would appear as an inverted “V”. The sickle feathers on the male should be wide and long. In recent years there has been a tendency towards narrow stringy sickle feathers but this does nothing to enhance the breeds appearance or appeal. In the allotted space I will touch briefly on topic of the combs. Too little emphasis is placed on the female Dominique’s comb. When viewed from the top it absolutely must start out rounded in front, flaring out to the sides, and then rounded back to the spike looking like a rosebud laid on its side. The comb must not be either a wedge or a thin narrow comb. The spike should turn slightly up from the base of the comb to the tip of the spike. Also, the spike should be as round as possible not wide or flat. The male Dominique should have a comb that is very similar to the female. There is a tendency to get the male comb too large and coarse. Looking from the front of the bird the male’s comb should never be so wide as to go past the eyes on the head. Using this as a rule of thumb the combs will be correctly sized for the bird. The male comb is where you also check for “hollow comb”. This is the condition where part of the comb is sunk-in or lower than the surrounding edges. Do not use males with this fault, as it is difficult to work with. Ideally the middle of the comb should be higher than any of the surrounding edges. There are some that consider a “flat top” as most desirable but I’ve found these males often produce offspring with hollow combs. There is so much I could say about feathering, but I will limit it due to space constraints. The Dominique is a medium feathered bird meaning it should not be soft and fluffy. When Dominiques are crossed with Plymouth Rocks they pick up the greater size and will have softer, longer, wider feathers. 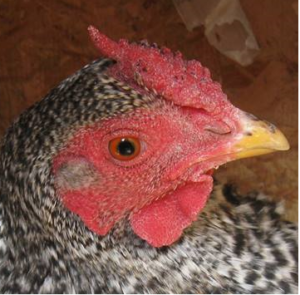 The presence of soft feathers generally shows up around the base of the tail with hens having what I call “fluffy butts”. The fault is best described as the group of feathers at the saddle that bulges out from the body instead of being streamlined. Often these soft feathers are accompanied with low tail carriage, which magnifies the problem. Avoid “fluffy butts” as breed conformation is difficult to maintain with this fault. Finally I will touch on the barring itself. The light bar should ALWAYS be wider than the dark bar on the feathers and they are never parallel to each other. There is a trend amongst some fanciers to “neaten up” the barring. I am adamantly opposed to changes in the breed’s characteristics.